Wildlife Mississippi promotes innovative and effective conservation practices through its publications, by sponsoring workshops for landowners and land managers, and by highlighting the economic value of good land and water management. Conservation in Mississippi has a rich history full of passionate professionals such as Fannye Cook, William Turcotte, Bill Quisenberry and others. We collaborate with experts and agencies to publish a number of handbooks that offer detailed technical information for landowners. Handbooks available for download cover restoration and management of longleaf pine forests and native prairie habitat, conservation easements and conservation provisions of the federal Farm Bill. Our quarterly magazine, Wildlife Mississippi, contains a wealth of information for private landowners wanting to improve wildlife populations, improve water quality and enhance outdoor recreation experiences. James L. Cummins, Wildlife Mississippi’s Executive Director, wrote a series of articles for Wildlife Mississippi magazine called "So Now You Have the Old Home Place", which provided detailed information on effective conservation practices on family land. The articles are available online for download and printing. Recently, Wildlife Mississippi and several partners developed a user-friendly online tool, the Conservation Finance Center, to assist private landowners in making conservation decisions based on economics. A landowner can make a comparative financial analysis of land uses to visualize the economic results of undergoing certain conservation practices. We offer educational resources such as wild game recipes and printable material woodworking for wildlife and kids’ activities. 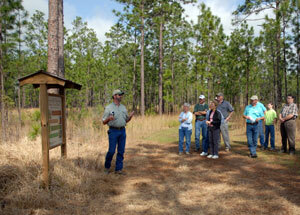 Publishes handbooks for landowners on conservation practices. Developed the Conservation Finance Center website. Prints quarterly magazine rich in educational content.